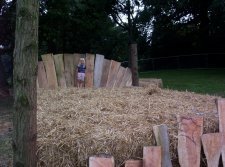 Strawbale fun at art spectacular! 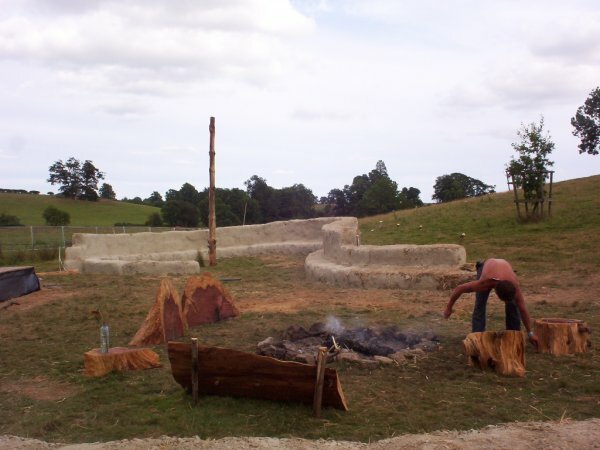 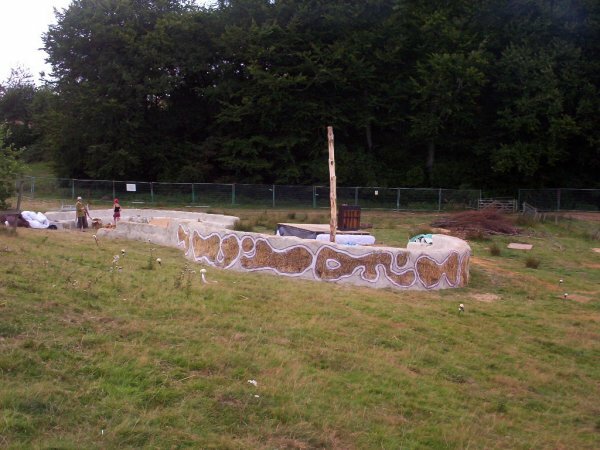 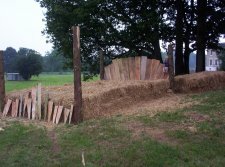 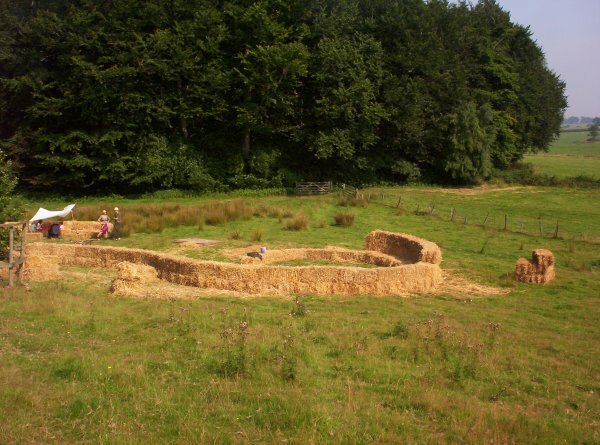 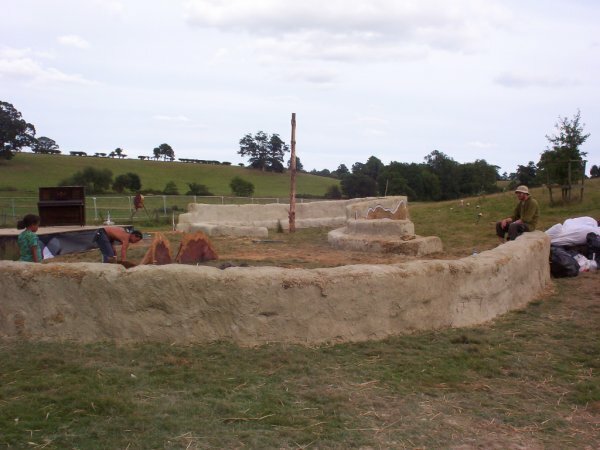 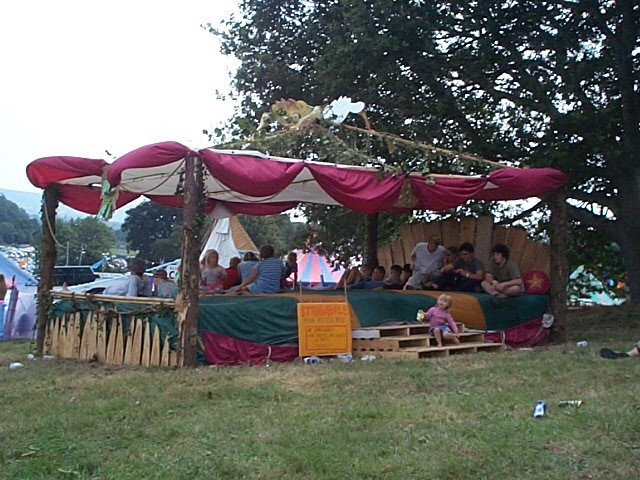 These are pictures of workshops I led for the Beautiful Days spectacular art festival in Devon, August 16th/17th to build a strawbale walled seating area, and also to let my imagination run riot and create a giant four poster strawbale bed! 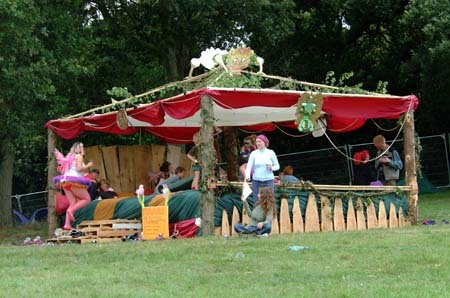 with fantastic soft furnishings by talented seamstress Laura Griffin and the art crew team. 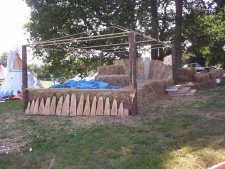 The giant strawbale four poster bed was made using approximately 96 bales, set two bales high and covering an area 6m x 4m in size. 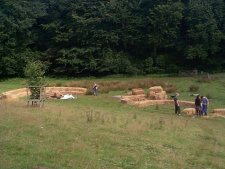 The outside course of bales was pinned all round using 1m long coppiced willow rods which secured the bales to the earth. 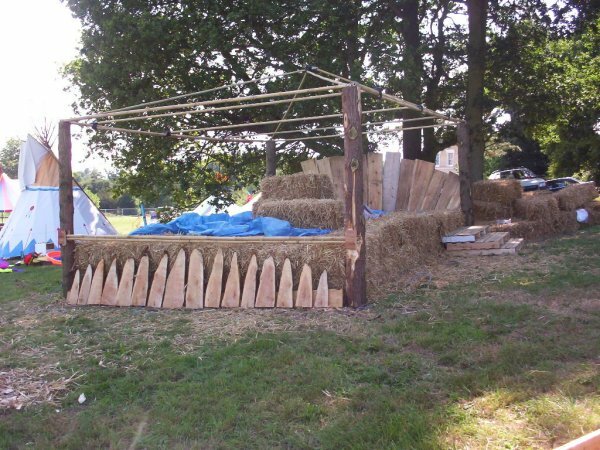 The four main uprights were cut from locally sourced Western Red Cedar as was the fan shaped headboard, and 'teeth' at the foot of the bed, the rest of the frame was of bamboo. Once the bed was constructed it was then given it's crowning glory of woven Ivy and gargoyles and canopy and colourful valences and covers and pillows, which all had to be made from fireproof materials. It's the little details that cannot be seen from pictures that made the bed so popular, like crossed spears and shields and flowers along the bottom valence and metres of gold braid. 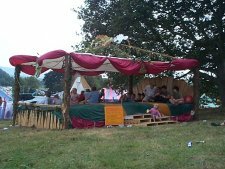 The bed proved to be one of the most popular attractions at the festival with many people enjoying watching the bands on the main stage from it's comfort and some even sleeping the night on it! 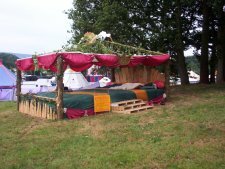 The bed was built to fit at least twenty people in comfort, it easily did that and on some occaisions you had a job to get a look in, as it was enjoyed equally by young and old alike! 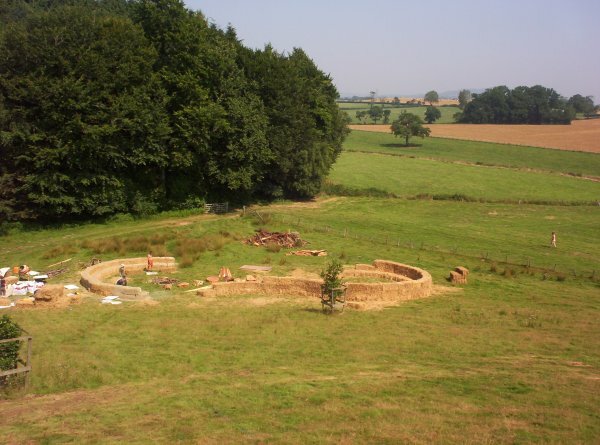 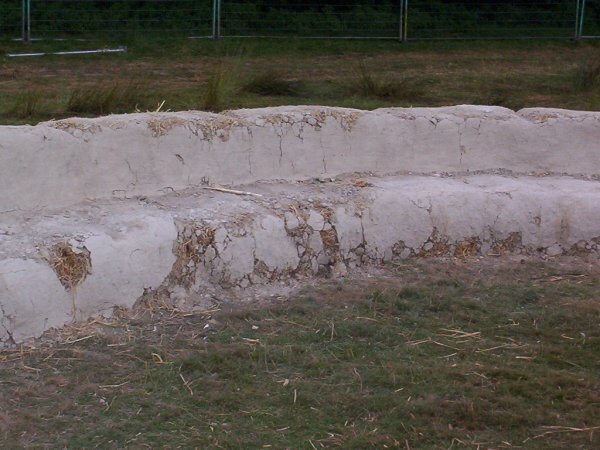 The walled seating area was built from a design by Richard Hammerton and Katherine Lamb, it had a two bale high semicircle wallseat pinned to the earth with 1m willow poles, here is the semicircle wallseat(left) and first part of the question mark. 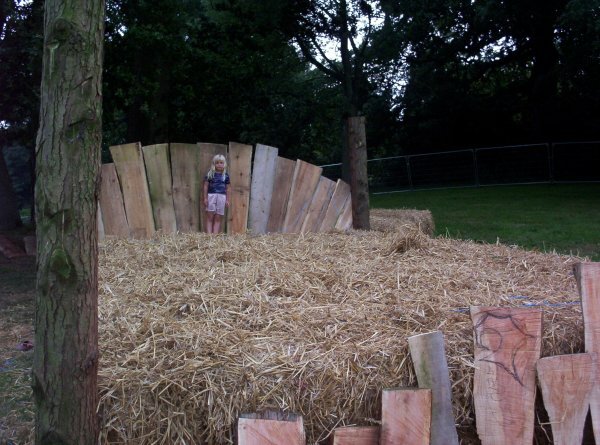 The question mark wallseat rose in height to three bales high as it curved round and then dropped back down, 1.5m willow rods secured it to the earth. 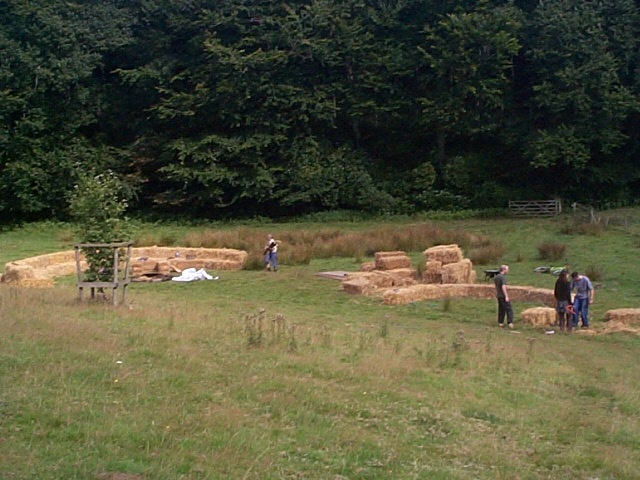 Here we see the third course starting to appear. 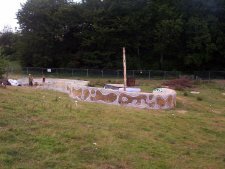 The two different shapes can be clearly seen in this image, the question mark is finished and pinned awaiting rendering, and the semicircle is already receiving it's first coat of earthen render, (1 part clay and 3 parts sand). The area where the wallseats were built also contained a campfire and accoustic jam stage, you can see the stage with a piano on it in the centre, the campfire is where the people are standing. 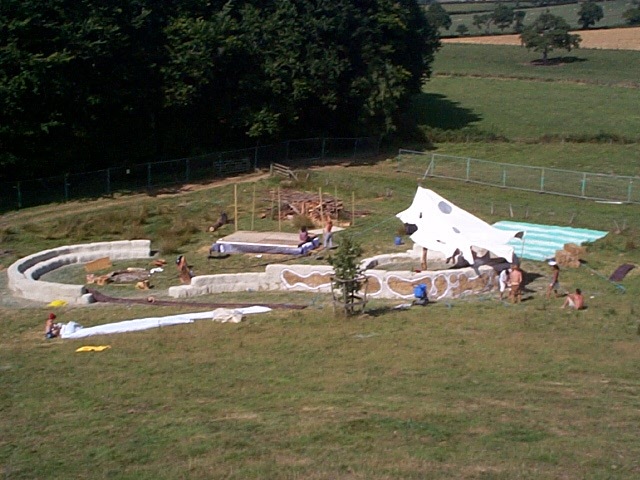 The question mark was decorated with this crazy design which allowed the bales to be seen beneath the earthen render, the pole in the middle is to support a canvas canopy. 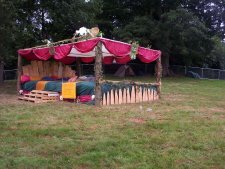 In this image you can clearly see all the components, the wallseats, the campfire, the canopy and the partially completed stage. 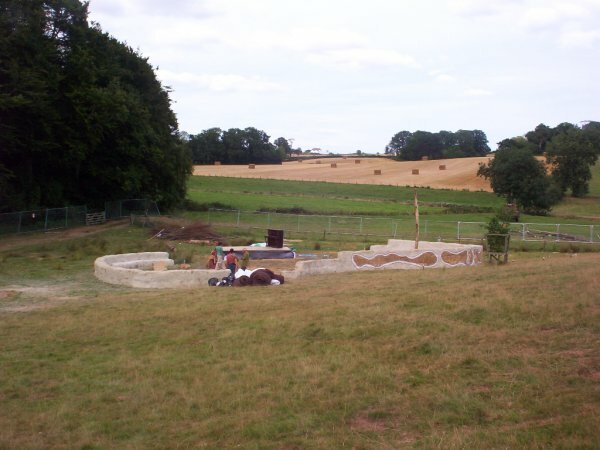 Here is a view from the semicircle wallseat across the campfire to the question mark wallseat and it's shape can clearly be seen. 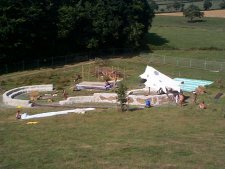 This image is looking from behind the semicircle after three days and at least a couple of thousand bums later, not bad considering the use they got. 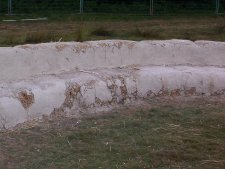 The earthen render held up to thousands of backsides better than anticipated and only cracked slightly, and in a few places(probably where it was not squidged into the bales properly) it parted company with the bales.